When I started working on a project investigating the Gulf Stream, little did I know that one day my job would bring me to the Seychelles. I knew that most of my PhD work would be focused on the North Atlantic, so dreaming of a trip to these lush, remote little islands in the Indian Ocean never even occurred to me. However, one of the benefits of being an oceanographer is getting chances to see secluded parts of the world. 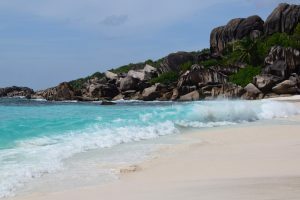 In this case, I was lucky and got to explore Mahé, the Seychelles’ main island, last month. My advisor, Robert Todd, is part of a project called “North Arabian Sea Circulation – autonomous research (NASCar)” sponsored by the US Office of Naval Research (ONR). 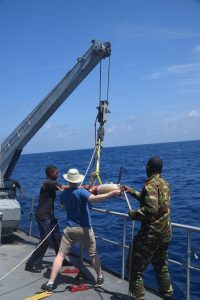 The goal of the project is to improve our understanding of the Northern Indian Ocean monsoon and its interaction with the Northern Arabian Sea circulation. Due to concerns about piracy in the region, there has been a lack of oceanographic observations in this area of the world’s ocean and thus the air-sea interactions there are poorly understood. This is where Robert and the NASCar project come in: autonomous vehicles allow us to sample parts of the ocean that were previously inaccessible; they can be released in coastal waters and piloted via satellite. Since these vehicles do not require open-ocean operations from large vessels, they can be steered into more dangerous areas without putting ship crew and scientists at risk. One type of instrument used in the NASCar project are gliders, a type of autonomous underwater vehicle that our lab frequently uses. Gliders look like small underwater planes that dive up and down through the upper 1000 m of the ocean in a zigzag pattern. While diving, they measure important characteristics of the ocean: temperature, salinity, pressure, and current velocities. These valuable data allow us to infer the density, depth, and movement of different water parcels. When these gliders surface, we can use satellites to get a GPS position fix, send new commands and waypoints, and download data from the previous dive through the Iridium satellite network. Fortunately for me, Robert needed a hand with putting the glider together and preparing it for the deployment. This is how I ended up scoring a work trip to this beautiful island nation that most people visit as a honeymoon destination, despite not being directly involved in the project. Since learning how to handle glider operations is part of my PhD, I had done two glider deployments in Miami before and I thought I knew what to expect for the Seychelles trip. 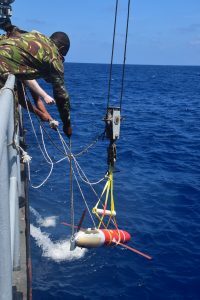 Another glider deployment, another tropical location – what could be the big difference? Well, it turned out that unexpected difficulties (like broken glider parts and problems with equipment clearing customs), lots of improvisation, and linguistic misunderstandings would make this trip more memorable and challenging than a routine deployment. Eager to escape New England’s cold winter weather and a series of Nor’easters and power outages, we embarked on our 10-day journey. A typical Miami deployment takes us three days, but soon I learned why it is necessary to budget more time for international fieldwork trips. After 32 hours of travel with a short stop in Zürich (Switzerland) and a night stroll through Dubai (United Arab Emirates) during our 12-hour layover, we finally reached Victoria, the Seychelles’ capital, on Sunday. After traversing almost all kinds of climate zones (from snow to desert to tropical rainforest), reaching these laid-back emerald islands surrounded by crystal-clear waters felt like the beginning of a holiday. The next challenge Robert had to face after an exhausting journey was driving on the left in our rental car, up the steep, windy mountain roads to our apartment in Beau Vallon. Conveniently, there aren’t many roads on this island and no-one is in a rush, everything is on island time. The total population of the Seychelles is about 91,000, with 90% living on Mahé. We made it over safely to the other side of the island, had dinner, acquired breakfast supplies and passed out. A long first night allowed us to get over the jetlag and 9-hour time difference quite quickly. 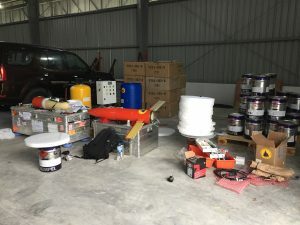 The next morning, we spent several hours finding and gathering our gear in the warehouse of our Seychelles collaborators. Part of it had been left behind from a previous deployment, other parts had shipped in a container weeks before, and one box had arrived with express shipping the previous week, but was still stuck in customs. At lunchtime, we drove with all our stuff (except for the box at customs) over to the base of the Seychelles People’s Defense Forces. After a bit of back and forth (that quickly became a routine since no one at the gate ever seemed to be informed that we were coming), the armed guards let us in. 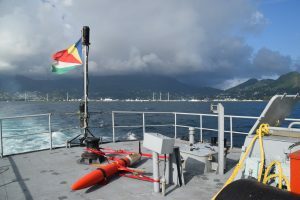 We met with Captain Hans and Lieutenant Connie, two members of the Seychelles Coast Guard who had agreed to take us out on their boat for the glider deployment on Thursday. They allowed us to work in one of the garages on the base and we set up our provisional lab using crates and paint buckets as tables and chairs. The glider gets shipped in parts (nose, tail, and wings are not attached to each other), so we started putting it together. Since some of our equipment was still stuck in customs, we had to improvise. We made new connectors by cutting up some of our cables and repurposed some of the power supplies. At some point, Robert was shocked when he touched both the cement floor and his laptop. We tested all the different components of our wire set-up, and sure enough, the cement floor was ‘hot’. It turned out that one of the sockets in the garage was shorting to the cement. Fortunately, Robert only mildly electrocuted himself and we were able to use another grounded socket from then on. However, we accidentally blew out the fuses in our power supplies during our search for the source of the problem. When we were sorting through our cable mess and reconnecting, we didn’t realize that we were connecting the American 120 V power supplies directly to the Seychelles 240 V socket without our transformer. Again, we were lucky that things didn’t turn out worse; we had extra fuses that were not stuck in customs. Without them, we would not have been able to continue our work. 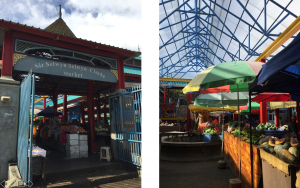 Rather than canceling our expensive trip and returning home unsuccessfully, we decided to attempt a repair and went on a hunt for a soldering iron around Victoria’s lively Sir Selwyn Selwyn-Clarke market on Wednesday morning. Surprisingly, finding a plumbing soldering iron wasn’t difficult in Victoria, but we were sent back and forth between six or seven small hardware stores until we found a soldering iron with a narrow enough tip for small electronics. 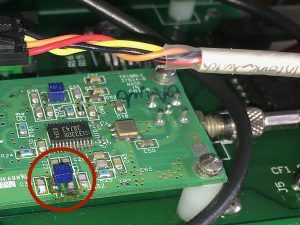 Under supervision from Scripps via a Google call, we were able to solder the piece back on without short-circuiting the entire GPS board. This small 3-mm long inductor not only kept us on our feet the whole day, it also created some sleepless nights for our group members and collaborators in California and Massachusetts due to the large time difference. We put the glider back together as fast as we could, and it successfully passed all the final checkout tests. In the meantime, our box still had not cleared customs, despite many calls from our collaborators. We were able to improvise and get around without most of the contents of the box, but we really needed the satellite phone in there for the next day’s deployment (to communicate with the glider pilots at Scripps). Again, we were incredibly luckily and at 6 pm on Wednesday the box finally reached us after first being delivered to the wrong Coast Guard base. I couldn’t believe it when on Wednesday night at 8 pm we were all set and ready to go. Only hours before, we were considering packing up without a deployment. Against all odds we seemed to have a functioning glider and didn’t even have to push the deployment back to Friday, our buffer day. After three eventful 12-hour days of sweating in a metal garage heated up by the equatorial sun, I was excited to go out on the water the next day. (In Miami, all these operations usually only take us 1.5 days.) So far, we hadn’t even had time to go for a swim to cool down. Although Miami and the Seychelles are probably equally hot (30°C/86°F) and humid, this was definitely a different experience from the usual work in an air-conditioned lab. During the long day out on the water, I needed to use the head (the ship’s toilet) at some point. When I asked one of the crew members for the location of the ‘restroom’, I received a very confused look. He talked to some of the other crew members in Creole and all of them seemed slightly baffled by my question. Finally, one of them took me down to his own stateroom and handed me a pillow and a blanket. Turns out that they thought that I was looking for a room to sleep/rest in. When I cleared up the misunderstanding, the whole boat broke out in laughter. We could still hear the friendly crew giggling about this on the bridge hours after the incident. 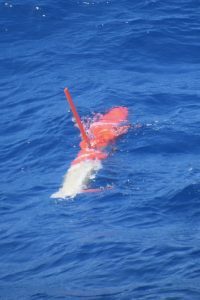 We waited until the glider completed its first two dives successfully and watched it go through all its communication procedures at the surface. After making sure that the glider was flying normally and that we hadn’t messed anything up with our soldering job that would require us to pick the glider back up immediately, we turned around and got back on land around 8 pm. 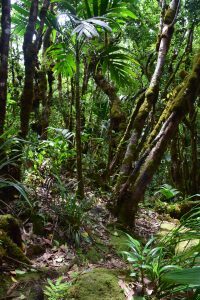 We used our two remaining buffer days to celebrate the successful deployment with hiking in the rainforest of the Morne Seychellois National Park and exploring La Digue, another more secluded island with pristine beaches and granite boulders. 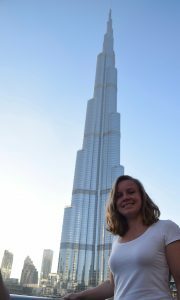 We even got to go up Burj Khalifa, the tallest building in the world, during another layover in Dubai. For now, the glider is successfully sampling across the equator. Its batteries last for around 110 days, so if everything goes well, it will be recovered in the Seychelles in June. All in all, I would say that we were very lucky in all our misfortunes. Despite all adversities, we had a successful trip and I am grateful for all the new places that I got to see and the things that I learnt about glider operations, improvisation and the challenges of international fieldwork. About the author: Joleen Heiderich is a PhD candidate in Physical Oceanography in the Massachusetts Institute of Technology – Woods Hole Oceanographic Institution (MIT-WHOI) Joint program. She is part of the Todd lab at WHOI and uses glider data to study Gulf Stream dynamics.